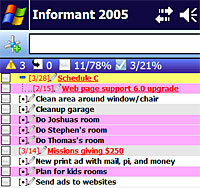 Pocket Informant 2005 is an integrated Pocket PC application that replaces the built-in Calendar, Contacts, Tasks, Notes, Journal programs and adds a Timeline view. Loaded with customisation options, the program lets you dabble with just about everything and anything you can see on screen - typefaces, font sizes, font colours, categories, category colours, icons - the lot! Although this seem a bit like overkill, the different screen sizes and resolutions available on PocketPCs means that controlling font sizing can come in very handy. So, how does this do-it-all Personal Information Manager (PIM) shape up? Let's take a closer look. The Calendar view offers a host of different views, displaying one day, seven day or whole month views on one screen, with the Agenda view presenting a user-selectable number of days of appointments in a list format, with the option to filter out 'free' days. New appointments may be added by tapping and holding on a day's title bar. Double-tapping on an entry opens its detail screen for viewing, editing or adding alarms. As soon as an event has passed it is displayed in italics, making it easy for the easily confused to see what events are remaining in the current day. 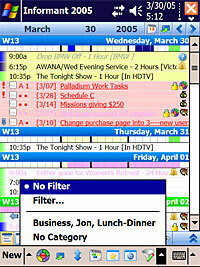 As with all the components in the Pocket Informant suite, a global navigation bar sits at the bottom of the screen, offering instant access to diary views, contacts, notes, to-dos and filter and search options. 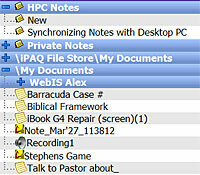 The Contacts screen opens up with a tabbed alphabetical row along the time allowing nifty access to contacts. 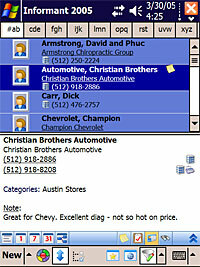 Inputting new contacts is straightforward enough, with the program auto-filling in frequently-entered text. A whole host of fields are available to include every possible detail of your new contact, with the option to associate mugshots with contacts, and assign multiple categories. The search facility is particularly clever, with users able to specify that the program looks for entries that start with the search text or for entries that contain the specified text. Once a number is located, it can be dialled IR, Bluetooth, DTMF or Serial. Naturally, there are options galore for listing contacts, including First/Last name, Last/First name, providing a picture list, and grouping by company, department, city, state, country, and category. As you might have guessed by now, the Tasks interface comes with a shedload of options, with entries being sorted/grouped by category, importance, priority, progress, completion, or date. There's the usual filtering and grouping options available, with users able to set up nested hierarchical tasks. Tasks may be dropped on others to establish relationships, child tasks can be created by tapping and holding on a task and the hierarchical display may be expanded or collapsed. Tasks can also be set to repeat with nagging reminders and start and completion dates entered. Here's where we were very disappointed. Unlike the simplicity of Palm's 'Memos', the handling of notes is a real half arsed affair in Pocket Informant - the display is a real dog to get around, and everything seems needlessly complicated. Sure, the improved text formatting is a nice touch, but finding, organising and categorising notes seems a needlessly tiresome chore. I hope the Pocket Informant developers - who have a well earned reputation for listening to their punters - take a long hard look at how programs like Agendus on the Palm handle notes and learn from their experience. Apart from the clunky horror of the Notes interface, it's easy to see why Pocket Informant has become the most popular PIM application on the Pocket PC. The program does an admirable job of making it easy for users to search find, organise and display content on the small screen of a Pocket PC and provides excellent value at $29.95. With its extraordinary amount of user-configurable options, the program can be tailored to fit individual requirements, and with ample power under the hood, it can easily grow with the user's needs. Although the sheer range of options can confuse new users (us included), the intuitive, usable defaults make it easy to get started with the program. Whether many users will ever get around to discovering the true power of the program is another matter, however. We still think, however, that it's the best PIM application available for the Pocket PC with only the poor support for Notes preventing it getting our very top rating.